On the map at right, red circles represent deceased children from Eastern European families, primarily Slovenes, but also Croatians, Hungarians, and Polish immigrants. Blue squares represent children from German immigrant families. Green diamonds mark deaths in families who migrated from England. The map does not show all deaths in Collinwood, but even with many unmarked the intensity of the town’s loss stands out. 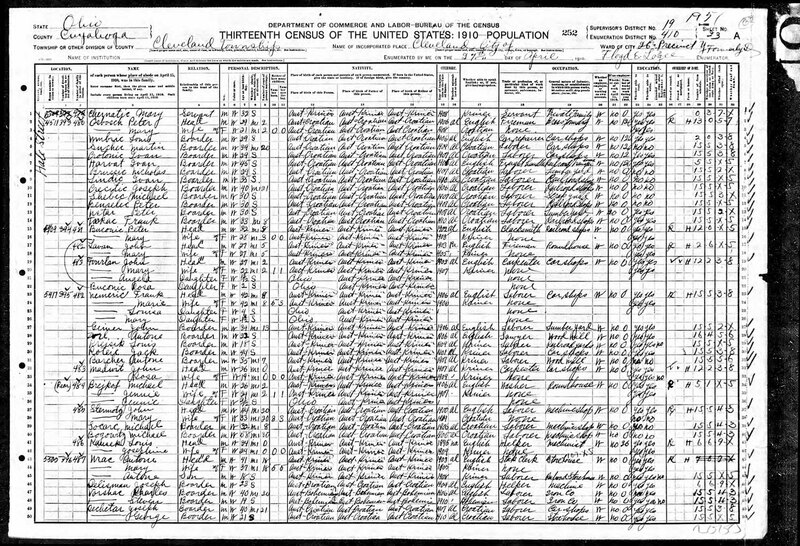 By 1908, German and English immigrant families had spread throughout the area North of the railyard, but families of Eastern European descent clustered into dense housing near the tracks and the Browning Engineering factory. This land stood empty in 1900, but when the Railroad expanded operations in Collinwood, The Lake Shore Land Company filled it with cheap houses on small lots for laborers. 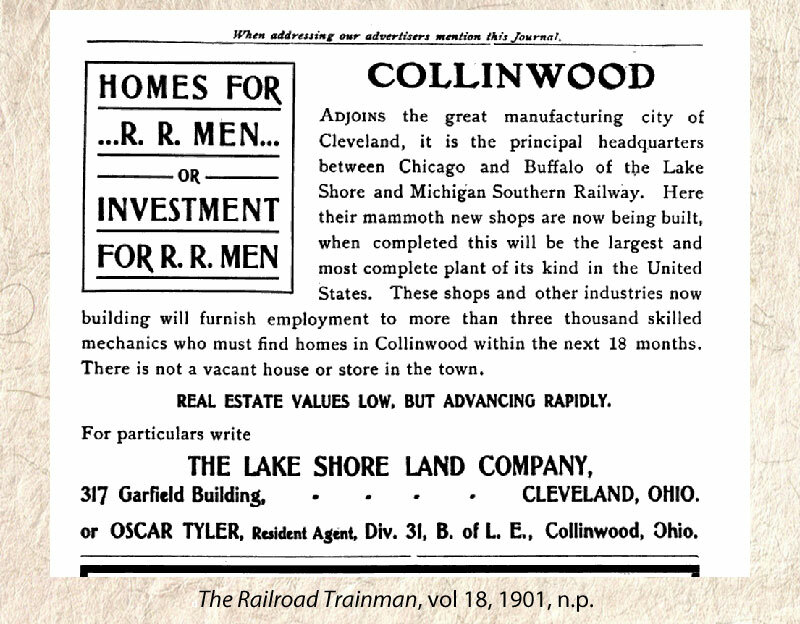 “Real Estate Values Low But Advancing Rapidly,” said their advertising in The Railroad Traiman, a journal aimed at rail workers. “There is not a vacant house or store in the town. . . . The mammoth new [railroad] shops . . . and other industries . . . will furnish more than three thousand jobs.” Eastern European families, including two who lost children in the fire, also occupied most of the houses on a stretch of Charles Ave closest to the tracks. Immediately behind the locomotive machine shop, Slovenian and Croatian bachelors packed a row of boarding houses. Almost all of these men were between twenty and forty years old and had arrived in the US within the last few years. In time, presumably, they hoped to marry and move out of this impoverished, congested neighborhood. New immigrants to the United States often first settled in enclaves where their native language and cultural practices persisted, where friends or relatives from their homeland had already established themselves. Such settlement patterns indicated a desire to preserve a sense of ethnic identity but were not always a matter of choice. Landlords, real estate agents, banks, and employers often worked to segregate particular ethnic groups, steering them toward agreed-upon neighborhoods. 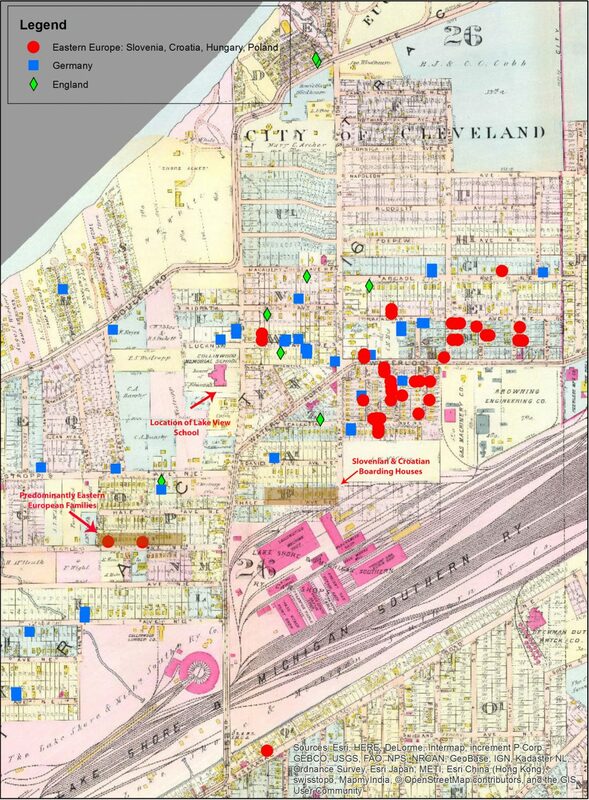 We have no compelling sources that clarify the extent to which Eastern European immigrants in Collinwood chose the settlement pattern so visible on the map and the extent to which more financially powerful figures drove them toward it. We can, however, see with certainty that death overran their neighborhoods with particularly brutal intensity.